Nick is a Maui boy and his love of health and fitness began there. He was born in the territory of Hawaii in 1946 and spent his youth on Maui swimming, playing with his friends and competing in an island age group swimming program starting at the age of 8. A subsequent move to Oahu in the summer of 1957 with his family brought new sports and challenges. Upon completing junior high school in Kailua, he was admitted to Punahou School – a prestigious college preparatory school founded in 1837 as Oahu College. Following his graduation in June of 1964, he travelled to the East Coast for college and graduated from Syracuse University during the turbulent 60s. He completed his degree work in 1968 – the year of assassinations, racial unrest, violence and nationwide antiwar protests. He graduated with a degree in History with a minor in English and was commissioned a 2nd Lt. in the United States Air Force. Graduating from Titan II Missile Combat Crew Upgrade and Operational Readiness Training at Vandenberg AFB with honors, he was assigned to the 381st Strategic Missile Wing at McConnell AFB, Wichita, Kansas. He was then assigned to an operational line crew with responsibilities for maintaining the alert status of a $10 million Titan II strategic missile weapon system that was an integral part of the nation’s strategic defense program. He separated from the AF at the age of 26 and moved to California where over the next 20 years he worked in business and industry in a variety of capacities while completing his master’s degree at night – attending Loyola Marymount University’s inaugural MBA program in Los Angeles, CA. In 1989, he entered the world of health and fitness as an ACE Certified Personal Trainer (1992) and later in 1995 was one of the first professionals to be certified as an ACE Lifestyle & Weight Management Consultant (now Health Coach). Starting in 1990, he began working with clients in their homes when, in 1998, he began training clients in fitness facilities located throughout Orange County, CA. 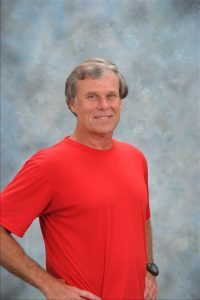 Through ACE – the prestigious American Council on Exercise – he has maintained the high standards of professionalism required by that body by attending international educational conferences sponsored by both IDEA (the International Association of Fitness Professionals and ACE symposiums) and ACE in order to maintain his certifications and create a greater body of professional skills and knowledge in order to meet the ever changing conditions and requirements in the world of the fitness professional.